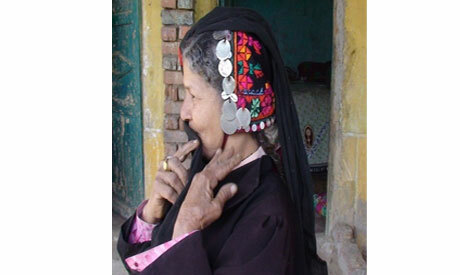 Women dressing up for special occasions in Sinai commonly use two main body garments, two head pieces, a face veil, a girdle, plus jewellery pieces. There is a janaa on the head, a burqou on the face. Beneath the embroidered tob, or dress, you can see the shirt's collar and a part of the shirt sleeves. There is a hezam, or girdle around the waist and shawahat on the chest.Women’s body garments, include two important pieces: the tob (dress) and the kamis (shirt).The tobThe tob is the traditional dress women wear for celebratory occasions such as weddings and feasts. 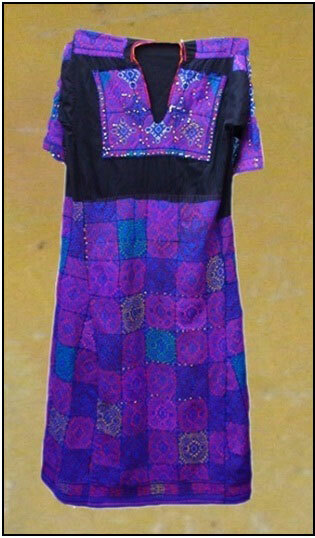 It has long sleeves, is floor length, and is embroidered with multi-coloured cotton thread in lovely patterns. The patterns are particularly bright because the tob is made of black material.Bedouin women make their own tobs, cutting, embroidering, and sewing them. An unmarried woman, with a lot of time on her hands, may take anywhere between one and four years to finish one tob. Married women, who have less time, may take up to seven years to finish one tob.On the other hand, The qamis is usually worn under their embroidered tob. The kamis is long sleeved shirt that is sometimes described as a gallabiya (the same word used to describe a broad genre of long robes). 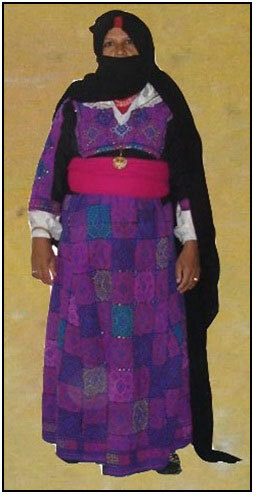 The qamis can either be bought ready-made in the market or be sewn by women from silk or satin, and is mostly white. As for the Accessories for the traditional garments, women wear head covers, face covers, girdles, jewellery and shoes along with their dresses for special occasions. Women wear two main head covers, called the janaa and the sajaa. The jannait is written qanaa but pronounced (janaa) is a cover that married women place on their heads, and it conceals also parts of the face and the body. It is a rectangle of gauze-like black cotton material measuring 180 by 150cm. A head cover used in celebratory occasions. It is a black cotton rectangle that is divided down the middle with a red line, called sabba. It is embroidered in bright colours in geometrical patterns, mostly shaped with triangles and diamonds. for women. It is a rectangle of black material measuring 55 by 25cm, connected with another rectangle of light coloured material measuring 80 by 25cm, often red. On the second rectangle, two pockets are sewn, which may be of different colour from that of the sajaa. These are used to carry money "as if it is her handbag or treasure chest." 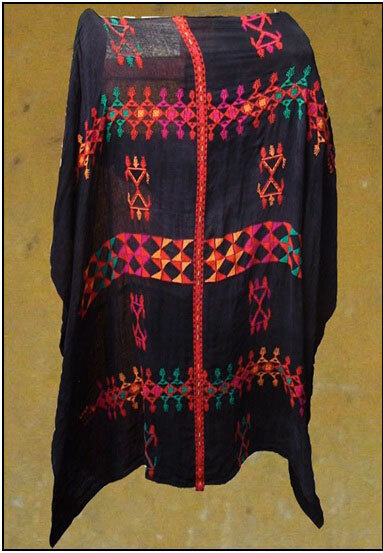 The black part of the sajaa is embroidered by hand with mostly geometric patterns, using coloured cotton threads. The outer rim is decorated with coins, shells, and buttons. The two edges of the big rectangle are decorated with beads and buttons, and so is the bottom part of the sajaa. To wear the sajaa, the woman places the heavily embroidered black part at the top of the head, binding the edges with a narrow ribbon under her chin. The two sides of the rectangle are tied behind the back, while the rest of the sajaa is allowed to hang loose. Older women still wear the sajaa to this day, but younger ones tend to use only the janaa or a tarha (large scarf) as a head dress. In the image, you can see the various segments of the burqou; namely, the forehead and the burqou's body. Also visible are the various jewellery sewn into the burqou. Here, you can see the sers, which is a band of real gold connecting the burqou's forehead with the moshakhsa and the layna, the embroidered bands at the top part of the burqou. Buttons are used to embellish the forehead. Moshakhsa: this is the band of pure gold coins, each called khayria, which are sewn to the burqou's fabric in a vertical line starting from the sers and ending in a metal wring to which are attached metal chains, each of which ends in round or triangular metal units, called totaha. Oyoun: these are metal chains, usually five. The burqou has two oyoun sets each fixed on one side to the upper burqou and on the other side at the end of the nawagelshi. The samaka: This is a piece of pure gold shaped as a crescent, from which dangle small coins, followed by a rectangle decorated with various stars and crescents, from which dangle more gold coins of various sizes. The burqou has two samakas, each positioned so as to drape down on both sides of the forehead. The top rim of the burqou, known as the layna, and the two side rims, are decorated with rows of silver and gold coins. The bottom rim is decorated with several rows of such coins. The burqou was part of the dowry given by the bridegroom to the bride. It carries the most expensive jewellery the woman owns, and is thus used to project her wealth and status. b) The best known type of bracelets is called siran. This is a bracelet that is up to 7 cm in width, made of silver and embellished with oval embossing of the same metal. It is serrated with straight and diagonal lines. The siran used to be presented as dowry in the past, and it is still regularly worn by older women. These are multi-coloured bead strings of various shapes and lengths. The string may be a band of connected beads, from which dangle strands of beads, each ending with a pear-shaped piece. Some strings are long enough to reach the waist. Women use coloured beads to come up with various designs suiting their artistic taste and providing them with exquisite accessories. Women no longer wear traditional footwear, but buy modern shoes from the market. Data Collected by : Maha El-Said Ahmed, Iman Mahmoud Orabi, and Rehab Kamal Ahmed.